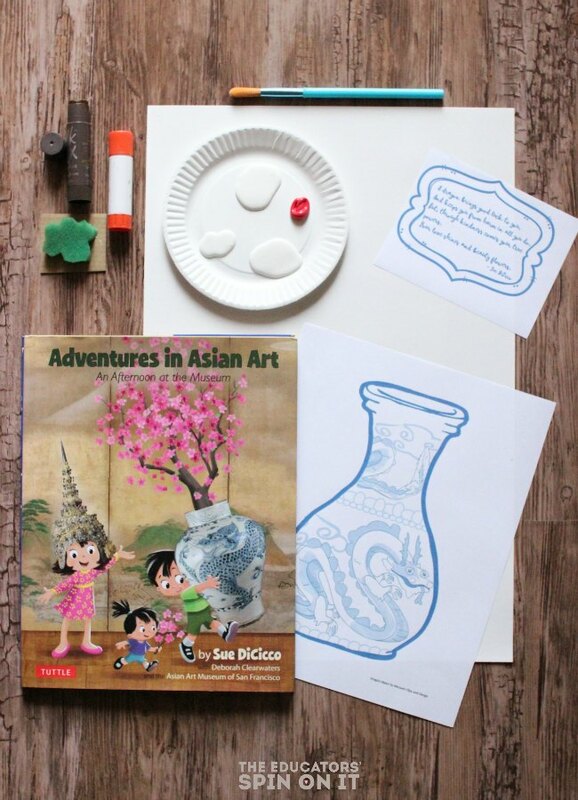 Connect literature, art, and raising globally aware children with this sweet little dragon vase painting project for kids. As part of the annual Multicultural Children’s Book Day, I am partnering with Tuttle Publishing to share one of the latest, and must have, diverse books for children. From a Japanese Samurai helmet to a Iranian Medallion rug, “Adventures in Asian Art, An Afternoon at the Museum,” gives children an introduction to a variety of Asian artwork. Join in the adventure and wander through the museum exhibit halls as you turn each page of the book. Discuss the colors and textures of the art with your children. Want to extend the learning even more? Try to find several of the places mentioned on a map of the world! ——> Get a copy of the book HERE. After reading, discuss some of your favorite pieces of art. 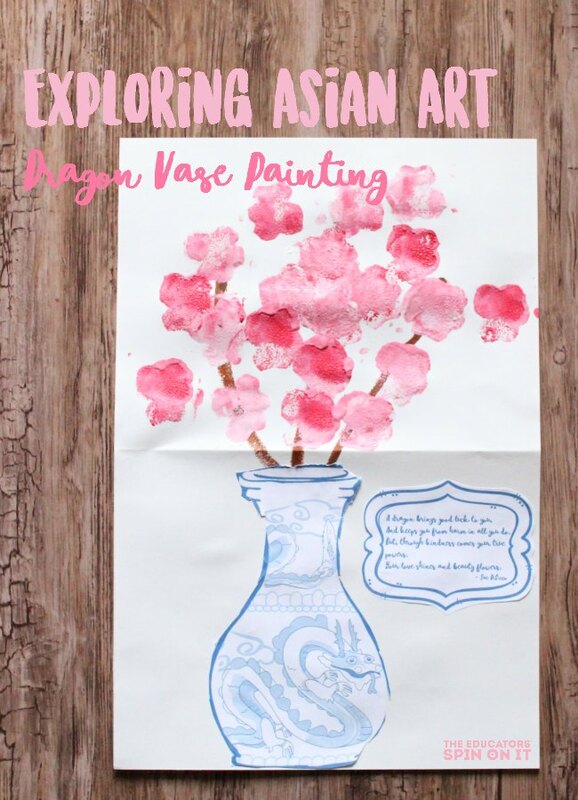 Then assemble the materials to make your very own dragon vase flower painting. Large white sheets of construction paper. ——> Download the vase and poem HERE. First, print one copy of the vase and poem from the book for each child. Then, cut the poem sheet into fourths on the dotted line. Then, make or purchase flower stamps. We hot glued flower sponges onto cardboard. Prepare the area for painting with children. Place paint on a paper plate for ease of clean up. Set the long white paper down in front of each child. Draw a 3 dots in the top third of the paper. One dot in the middle, just below where the top of the vase would land when placed on the paper. Using a brown marker, have the child draw a line from the top dots to the lower one. Encourage older children to look at a branch for inspiration. For younger children, say “connect the dots to make the branches.” Point to the two dots that need to be connected. Fold the white paper in half so the tops of the branches are facing upwards. This keeps all the flowers on the top and gives the effect of flowers in the vase. Let the children mix red and white to make 3 or more hues of pink. 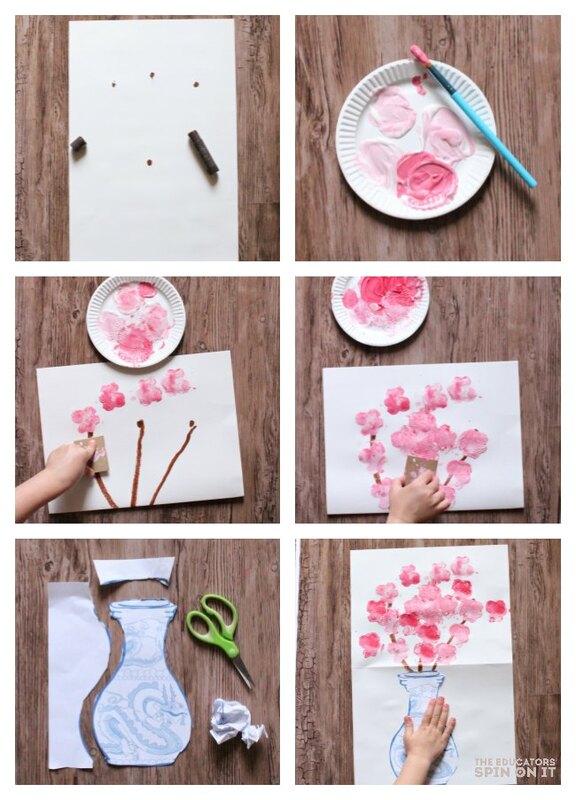 Stamp pink flowers in the paint and onto the branches. Have the children cut the vase out while the paint is drying. Have the child sign their name on the bottom and write the year it was painted. Then, go on your own afternoon adventure. Spend an afternoon exploring an Asian art collection at your local museum. See if you can find miniature sculptures (netsuke), a tea kettle, or even a picture of a dragon. Don’t forget to leave with a little souvenir – it’s not only a great way to remember your afternoon adventure, but also supports local arts! Love this Asian art project-trying to do more crafty and artsy things with my daughter while teaching her things at the same time! !